Fig. 4. Triple labeling of Drosophila embryonic nuclei using confocal fluorescence microscopy in two stages of the cell cycle. The mAb 1A1, an IgM that recognizes the spindle matrix protein skeletor, was detected by TRITC-conjugated anti-mouse IgM secondary antibody. A rabbit polyclonal antibody raised against lamin (generous gift of Dr. P. Fisher) was detected by FITC-conjugated anti-rabbit IgG secondary antibody. 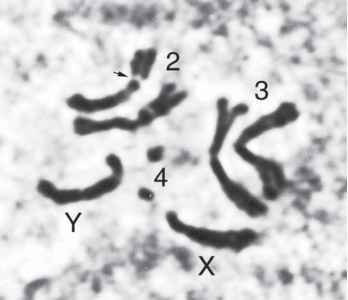 Hoechst was used to stain the DNA. of xylene. If the embryos do not settle, repeat the ethanol extractions (see Note 37). 4. Using a Pasteur pipet, place the embryos onto a microscope slide in several drops of xylene, and quickly aspirate off much of the excess xylene, and rapidly place five to seven drops of DEPEX mounting medium on the embryos (see Note 39). Spread embryos using a P200 tip, place a 22 x 40-mm2 cover slip over the embryos, being extremely careful not to trap any bubbles (see Note 40). 5. Place a weight onto the cover slip (we use a brass weight of approx 1.5 mm diameter weighing approx 170 g) to assist even spreading of the DEPEX mountant completely to the edges of the cover slip and leave undisturbed overnight until the mountant has fully hardened. Hardened mountant that has oozed out from under the cover slip can be trimmed away using a sharp razor blade. 6. Image embryos using standard light or Nomarski microscopy or store slides at room temperature. 1. Prepare antibody solution for injection (see Note 41). Aliquot antibody and store at -80°C or use for injections immediately (see Note 42). 2. Set up four collection bottles with approx 250 flies in a 25°C humidified incubator (or at your desired temperature) and allow them to lay 2-4 d before collecting for injections. Change the plates daily. 3. Allow the flies to prelay on a fresh plate for 30 min before changing to the collection plate. Allow flies to lay on the collection plate for 30 min (see Note 43). 4. Prepare injection needle as follows: Using a standard micropipet puller, pull glass filament capillary tubes to give a tip diameter less than 6 |im. 5. Prepare a second glass capillary tube with a tip diameter greater than 40 |im to be used later for vacuuming leaked cytoplasm (see Note 44). 6. Load the injection needle with antibody solution by placing the back end of the capillary tube in a microfuge tube containing antibody solution. Capillary action will draw the solution into the needle (see Note 45). Alternatively, the needle can be loaded by back-filling with a heat-pulled Pasteur pipet or Hamilton syringe. If bubbles are present, they can be removed by applying a vacuum for 1-10 min (see Note 46). 7. Prepare several cover slips by applying "embryo glue" (see Note 47) to the edge of a 22 x 22-mm2 cover slip with a Pasteur pipet, spreading it along the edge as if buttering toast in a rectangular pattern slightly larger than the dimensions covered by the spread embryos. Make several such cover slips and allow to air-dry. 8. After the 30-min collection, align embryos on a cover slip as follows: Wash the embryos into a small collection basket and dechorionate as described in Subheading 3.1., step 5 (see Note 48). Place the Spectra/Mesh nylon filter on top of a paper towel briefly to remove excess water. 9. Prepare an apple juice agar pad by excising a rectangular block of agar (approx 40 mm x 10 mm) from an apple juice plate poured as described in Subheading 3.1. (see Note 49.). Align approx 75 embryos in 2 parallel rows without touching each other, as shown in Fig. 5 (see Note 50). 10. Gently lower the glue edge of a cover slip (prepared in step 7) onto the arrayed embryos to transfer them to the cover slip. 11. Desiccate the embryos 8-12 min by placing the cover slip, embryo-side down, in a sealed jar containing DrieRite (see Note 51). Prop the cover slip so as not to allow embryos to contact the DrieRite or it will stick to the glue. 12. Place the cover slip on a slide (embryos up) and cover embryos with a thin layer of halocarbon oil. Place the slide on the microscope stage with the embryos oriented along the cover slip edge closest to the micromanipulator. Fig. 5. In preparation for injection, embryos are lined up in two rows along the edge of a block of apple juice agar that has been excised from an apple juice plate. The alignment shown here is intended for a lateral injection site. 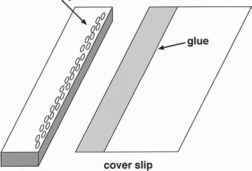 "Embryo glue" is applied to the edge of a cover slip, providing a sticky surface on which to pick up the embryos from the agar block to immobilize them for injection. Once affixed to the cover slip, the cover slip will be placed on a slide and overlayed with a thin layer of halocarbon oil. (Adapted from ref. 35). micromanipulator mounted on an inverted microscope stage. Gently break the tip of the injection needle by touching the needle tip against the debris of broken cover slips that have been secured with doublestick tape on a glass slide while monitoring the process under the microscope. 14. Position the injection needle so it is aligned perpendicularly with the first embryo. Set the three-way valve regulating air and vacuum pressure to the air setting. By moving the stage towards the injection needle, insert the needle into the embryo and cover the open three-way valve to allow the air pressure to force the injection solution into the embryo. Withdraw the needle quickly and carefully to minimize the loss of cytoplasm (see Note 52). 15. After completion of the set of microinjections, vacuum away any leaked cytoplasm using the larger bored capillary tube prepared in step 5. 16. If the embryos express a fluorescently tagged protein (e.g., green-fluorescent protein [GFP] or any of its color variants), the embryos can be directly observed using confocal microscopy. If the embryos are to be fixed in preparation for antibody or Hoechst staining, after incubating for the desired time, dry excess oil from the back of the cover slip, place the cover slip in a 60-mm Petri dish, and wash several times with PBST to remove as much halogen oil as possible. Add fixative : heptane (50 : 50) to the Petri dish and rotate for 20 min to allow fixation. Manually devitellinize the embryos as described in Subheading 3.2., step 3. Proceed with labeling and detection as described in Subheading 3.4. The result from Hoechst staining of one such perturbed antibody-injected embryo is shown in Fig. 6. Fig. 6. Results from an antibody perturbation experiment. The mAb 1A1 recognizing the skeletor protein (A) or a control IgM antibody that does not stain Drosophila embryos (B) were injected into early, syncytial embryos as described in Subheading 3.7. Embryos were allowed to develop for 2.5 h at 20°C prior to fixation, devitelliniza-tion, and Hoechst staining. DNA staining revealed many fewer nuclei and severe chromosomal abnormalities in the antiskeletor antibody-perturbed embryos, whereas the control-injected set continued to develop indistinguishably from wildtype. 1. Change plates daily for best results and monitor humidity. If flies are "drying out" in the population cage, add a "spa" by moistening a Terri-towel in a weigh boat and place it in a corner of the cage. 3. Collection plates must be at the collection temperature before use. Females will not lay eggs well on cold plates! 4. "Feeding" plates should be fully spread with yeast, and changed more frequently if flies are laying heavily. If staging is critical, it is essential to do a "prelay" collection of 1 h before exchanging the prelay plate with the collection plate, as females will retain fertilized eggs for some time if they feel conditions for laying eggs are not optimal. 5. Collection times will depend on desired stage of analysis; see ref. 38 for a staging guide. 6. It is essential to process embryos rapidly and avoid large aggregations to prevent anoxic effects (39), which can lead to a range of defects, most notably chromosome bridging at anaphase (26). Therefore, it is important to have your fixation tube ready immediately after dechorionation. We use a 15-ml test tube because when attached horizontally to a shaker, it provides an extensive interface between fixative and heptane layers, thus allowing embryos to spread out in a monolayer (see Subheading 3.1., step 7). 7. There are many different fixes available with respective advantages and disadvantages. One should experiment with several different fixatives to determine which preserves both antigenicity of the protein of interest as well as morphological structure (see refs. 31 and 32 for detailed descriptions of different fixatives and the principle of fixation for each). We have obtained best results with Bouin's Fluid fixative, which is a precipitative fixative characterized by its rapid penetration and efficient fixing action on the nucleus. The combination of fixative agents in Bouin's Fluid (picric acid is precipitative, acetic acid enables rapid penetration and dissolves lipids, formalin crosslinks proteins) is particularly effective. 4% Paraformaldehyde fixes tissues primarily by crosslinking, and although it has moderate penetration, its fixing action is slow. Where mass devitellinization is performed, it should be noted that methanol not only induces removal of the vitelline membrane but also acts as a fixative, precipitating proteins and solubilizing lipids. 8. Heptane is essential for creating small holes in the vitelline membrane, thus allowing penetration of the fixative into the embryo. 9. Many different collection baskets of different sizes have been described (26,28,37) with various advantages for ease of use. We use a double-collection-basket system comprised of two screen cups (Sigma-Aldrich, no. S1145) where the top cup contains a single 40 mesh screen (Sigma-Aldrich, no. S0770) to trap any adult flies that might have stuck to the apple juice plate. Embryos wash through his mesh to the lower cup, in which we have installed a 70-|im nylon filter (Spectra/Mesh) above the 40 mesh screen to trap the embryos. This doublecup system fits nicely into a 250-mL beaker to allow manipulations with a paintbrush and squirt bottle to wash embryos into the basket. 10. Bleach loses its potency after dilution and with aging. Buy small bottles of Clorox to increase inventory turnover. If problems arise with embryos failing to sink in methanol at later stages (Subheading 3.1., step 10), suspect that the bleach is not at the proper strength and visually monitor for dechorionation under a dissecting microscope. 11. Work rapidly to prevent anoxic effects. These techniques expose embryos to heptane prior to their exposure to fixative, which facilitates even fixation. If you observe gradients of fixation, suspect problems with crowding of embryos or fixation penetrance and try either fixing fewer embryos at a time and/or pretreat-ing embryos (30-60 s) with heptane only before adding fixative to the tube. 12. A convenient method for vigorous agitation available in most laboratories is to securely tape your tube to the arm of a shaking water bath set at 220 rpm. 13. The duration for fixation should be empirically determined to optimize results for any given antigen-antibody interaction. In some cases, shorter times may give adequate fixation and better penetration. Longer times may be necessary, but beware of overfixation, which would lead to reduced antibody penetration. 14. Draw up a small quantity of heptane and then try to pick up the embryos at the interface. Before releasing pressure on the pipet bulb, pick up more heptane from the top layer. This heptane will "bubble up" through the Pasteur pipet, dispersing the embryos contained within the pipet, and, usually, causing them to settle nicely at the interface between the fixative and the heptane layers contained within the pipet. Squeeze out the fixative layer back into the fixation test tube and transfer only the embryo layer to the new methanol-EGTA/heptane tube. It may take several rounds of this aspiration to move all of the embryos. With practice, you can transfer the embryos with a minimum of either the fixative or heptane layers. 15. If embryos are slow to settle or the yield seems especially low, the tube can be shaken vigorously for an additional 15 s.
16. Embryos will settle more slowly upon introduction into the aqueous buffers. Failure of the majority of the embryos to sink within several minutes may indicate incomplete extraction of heptane from the embryos and indicates a need for further methanol extractions. 17. Because many commercially available and commonly used secondary antibodies are raised in goats, we generally employ normal goat serum (NGS) in our blocking buffers. However, it is critical in your design that blocking agents and antibodies be compatibly matched. For example, if your primary antibody was raised in goat, you could not use goat serum to block nonspecific sites. Typically, match the blocking buffer serum type with that of the species used to generate the secondary antibodies in your experiment. 18. After aspirating off the final PBS wash, "precoat" the Pasteur pipet with the Blocking Buffer before transferring the Blocking Buffer to the embryos. Use the precoated pipet to transfer the embryos in Blocking Buffer to the 1.5 mL microfuge tube. Failure to "precoat" Pasteur pipets can result in embryos sticking to the pipet surface. 19. In most cases, embryos can be stored at 4°C in Blocking Buffer containing 0.05% sodium azide for several weeks without significant loss of staining resolution. 20. The amount of heptane transferred in the drop and the speed at which embryos are spread and covered with PBST are critical and will need to be determined with practice. Too much heptane will seriously dissolve the doublestick tape surface, resulting in embryos being mired in the tape and sliding out from under the tungsten needle in Subheading 3.2., step 3, without devitellinization. Too little heptane and the embryos will not stick sufficiently to the surface to allow needle pressure to pop the embryos out of the vitelline case. With the correct amount, the vitelline membrane will stick firmly to the doublestick tape surface, but the tape will still be firm enough to support the applied pressure. 21. Best results will typically be obtained if you do not exceed approx 30-50 |L volume of embryos. Use of too large a volume of embryos may result in weak or variable staining. 22. Primary antibody dilution should be empirically determined by comparing results from a dilution series. If the primary antibody was raised in rabbit, affinity purification is recommended due to high backgrounds in Drosophila staining typically found to be present in rabbit serum. 23. Secondary antibody should be directed against the species in which the primary antibody was raised and should be affinity purified (commercially available as such). 24. The presence of Triton X-100 or sodium azide will inhibit the HRP reaction. 25. Typically, we use HRP detection only for single labeling studies because multiple labeling is more easily performed using fluorescent tags (see Subheading 3.4.). However, if so desired, it is possible to use enzyme-linked secondary antibodies to do double-labeling experiments by employing an alkaline phosphatase-conjugated secondary antibody against the second primary antibody that will give a blue-black reaction product distinguishable from the brown HRP reaction product. The reader is referred to Johansen et al. (40) for an example of such double labeling. 26. Double and triple labelings require careful selection of isotype- and species-specific secondary antibodies and care must be taken that in no case are secondary antibodies raised in a host in which one of the primary antibodies were raised. However, should that prove impossible it may be possible to judiciously select a defined order for sequential incubation with primary and secondary antibodies to avoid such crossreactivity. 27. Most commercially available secondary antibodies work well at 1 : 200-1 : 400 dilution, but should be empirically determined for each lot. Select only affinity-purified antibodies and test for crossreactivity with Drosophila embryos in the absence of any primary antibodies. We have not had any problems with affinity-purified antibodies from Bio-Rad, ICN/Capell, or Jackson ImmunoResearch, but have observed background problems in non-affinity-purified antibodies from other sources. 28. Filtration removes fluorescent aggregates that may appear as speckles in the epifluorescent images. Presence of bubbles in the filtrate may denature proteins, compromising antibody performance. 29. From this stage onward, cover the tube to protect from light and minimize quenching of the fluorescent signal. 30. Failure to remove Triton X-100 will reduce or eliminate the Hoechst staining signal. 31. By keeping the edge of the pipet opening pressed against the microscope slide, you can aspirate off the buffer without removing the embryos. This will not work if the pipet tip is chipped or cracked. 32. «-Propyl-gallate is added to reduce quenching of the fluorescent signal and is not necessary for the mounting of HRP-labeled preparations. 33. Use brightly colored nail polish instead of clear in order to observe whether the edges are fully sealed. 34. Some signals, particularly labeling deep in the interior such as the nervous system, may require overnight clearing for maximal visibility and resolution. Although most labelings will be immediately obvious, we recommend also viewing your preparation after allowing for overnight clearing. 35. DEPEX-mounted slides are considerably more difficult to prepare but provide exceptional clearing and resolution and when properly mounted, will store indefinitely. 36. Xylene solvent will dissolve plastic microfuge tubes. 37. It is critical to use absolute ethanol for the final extractions. Any remaining aqueous buffer (e.g., from 95% ethanol) will prevent complete penetration by the xylene and the embryos will not sink in the next step. Therefore, use only a freshly opened bottle of 100% ethanol or use 100% ethanol stored over dehydration beads. 38. Xylene is highly volatile and a respiratory irritant. This work should be performed in a hood. 39. The xylene will evaporate extremely rapidly so it is crucial that these steps be performed quickly to prevent the embryos from drying out. 40. If even small bubbles should form beneath the cover slip, the slide will not be permanent, as the size of the bubbles will continue to grow over time. However, after overnight clearing even if bubbles are present you should at least be able to obtain images from many of the embryos that are not yet overtaken by bubbles. 41. In order to have sufficient antibody for effective perturbation, it is recommended that it be concentrated such that it will give strong embryo staining when used as described in Subheading 3.3. at a dilution of 1 : 1000 or more. High concentrations of antibody may be difficult to inject, however, because of increased viscosity. Thus, optimal conditions must be established balancing high antibody titer with ease of injection without needle clogging. Antibodies can be purified using one of several commercially available kits (e.g., Pierce or Bio-Rad). 42. Whereas it is convenient to prepare antibody and store for later use and it is preferable to compare different experiments using the same "lot" of antibody, some antibodies do not store well. Thus, it is critical to assay for antibody activity after storage. Antibodies that are aliquotted for storage must not contain preservatives such as sodium azide or thimerosal if they are to be used for microinjection. 43. Best results are obtained if there is minimal disturbance of the flies or incubator during collection periods. In addition, we consistently find low yields of eggs on overcast or rainy days, suggesting that egg-laying behavior may be sensitive to barometric pressure. 44. Prepare needles on the same day as the injections are to be performed in order to maintain tip sharpness. However, 5-10 needles should be prepared before beginning injections so as to have replacement needles handy, if needed. 45. Leaning the capillary tube at a 45° angle will help prevent bubbles from becoming lodged in the pipet. 46. We use in-house outlets for air (30 psi) and vacuum (700 mm Hg) systems. 47. Embryo glue is made by extracting double-sided tape or brown packing tape in heptane overnight. 48. Because of the relatively small numbers of embryos obtained within a 30-min collection, it is easier to use a smaller collection basket constructed from a plastic scintillation vial from which the bottom has been removed. Drill a hole into its cap and use to secure a small square of Spectra/Mesh screen (70 |im mesh size) over the mouth of the vial. Embryos can be washed and dechorionated in this smaller basket and the filter can be removed after dechorionation for easier access to embryos. 49. Using an apple juice pad will facilitate the orientation of the embryos because they can be nudged into position with a forceps prior to picking them up on the cover slip (see Subheading 3.7., step 10). 50. For antibody perturbation, we typically inject laterally in order to achieve a centralized injection site. However, alternatively, embryos can be aligned with either anterior or posterior ends oriented toward the cover slip edge if injection into one of the poles is desired instead. 51. The time required for desiccation will depend on the genotype of the embryos, the temperature, and the ambient humidity. Typically, we desiccate for 8 min ± 30 s. If significant cytoplasm leakage occurs after injection, try desiccating for slightly longer periods. 52. Proper desiccation will enable injections to be performed without cytoplasmic leakage. Typically, we inject 1 nL volume per injection.